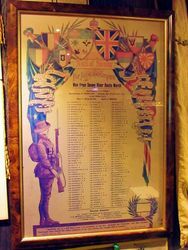 Men from Snowy River Route March Honour Roll commemorates the men who particpated in the recruiting march from Delegate to Goulburn in January 1916 to enlist in World War One. 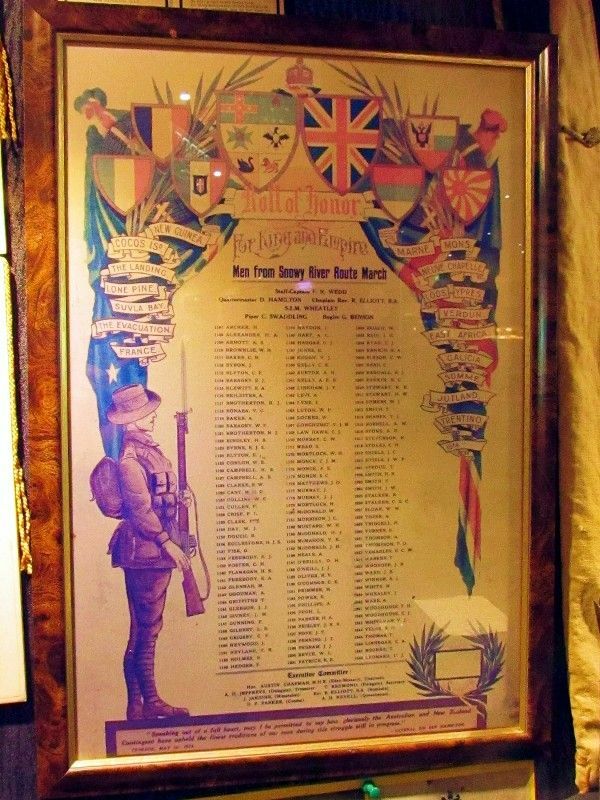 The roll is artistically presented and lists the campaigns of World War One. An enthusiastic meeting was held at Nimmitabel yesterday. Representatives from many Manaro (sic) centres from Delegate to Bungendore were present, and Mr. Austin Chapman, M.H.R., presided. 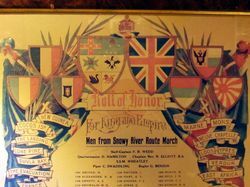 It was decided to inaugurate a snowball recruiting march of men from Snowy River, to start at Delegate on January 8 and proceed to Goulburn. Many recruits promised to join, and generous support and help from a number of centres will be forthcoming. General and executive committee were appointed and meetings to stimulate recruiting are to be held immediately in all centres. The Minister for Defence, the State Military Commandant, and the Inspector-General of Police are to be requested to give every assistance. It is confidently believed that a goodly number of men from Snowy River will march into Goulburn near the end of January. Mr. Jeffrey (Delegate) was appointed treasurer, Mr. Redmond (Delegate) secretary, and Mr. Elliott (Bombala) route march secretary. The executive committee consists of Messrs. Jeffrey (Delegate), Elliott (Bombala), Jardine (Nimmitabel), Parker (Cooma), and Nevell (Queanbeyan), with Mr. Austin Chapman as permanent chairman. Much enthusiasm was manifested and a big success is assured. The delegates were generally favourable to Goulburn being the final stage for the route march. The Hon. A. Chapman said that he was in favour of the proposal, as he thought the result from a recruiting view would be better than if they were to be marched to Sydney. The motion was passed that Goulburn be the depot for the terminus. The distance will be about 225 miles, and it is anticipated that the men will arrive in the camp about the 29th of January, 1916. About 25 recruits are already waiting for the march. Goulburn Evening Penny Post (NSW), 18 November 1915. Quartermaster D HAMILTON Chaplain Rev. R. ELLIOTT B.A. "Speaking out of a full heart, may I be permitted to say how gloriously the Australian and New Zealand Contingent have upheld the finest traditions of our race during this struggle still in progress."